Since most property owners mortgage or borrow money at the time of purchase or during ownership, the lender can be expected to request protection of its investment against loss. Lenders know that man things are incurred while defending and attack. They insist upon a Mortgagee's Title Insurance Policy to protect their stockholder's and investors' investment in your property. An Owner's Title Insurance Policy protects your investment (equity) as the buyer or owner of the property. As the owner, you should want to have the same assurance as the lender that the investment you have made cannot be lost because of a problem or defect with the title. WHAT DOES A TITLE POLICY COVER? A deed or other document in your chain of title is invalid as a result of (a) forgery, (b) fraud against the rightful owner, (c) a signature given under duress, (d) a signature by someone legally incompetent to sign of (e) someone claiming to be someone else. A lien against your title exists as a result of a previous owner's failure to pay: (a) a mortgage or deed of trust, (b) a judgment, tax or special assessment (c) a charge by a homeowner's association or condominium association. If you receive a notice of a previous lien, contact your title company immediately and follow your policy's claim procedure. Failure to do so could jeopardize your claim. A lien exits for labor or materials furnished by a contractor without your consent. Generally, your policy protects you if you buy you house already built, but not if you own the land and contract with a builder to build your home. You should consult an attorney about your rights. Leases, contracts or options on you land were not recorded in the public records and not disclosed to you. A notary public erred or someone: (a) failed to properly sign a document in your chain of title, (b) made an error in recording the document at the clerk's office or (c) failed to deliver the deed according to statutory requirements. The title policy failed to disclose legal restrictions in how you can use your property. The title policy assures you legal right of access to your property. This means that you have a right to travel from your property to a public street or road. Other liens or encumbrances on your title but not listed in the policy exceptions. 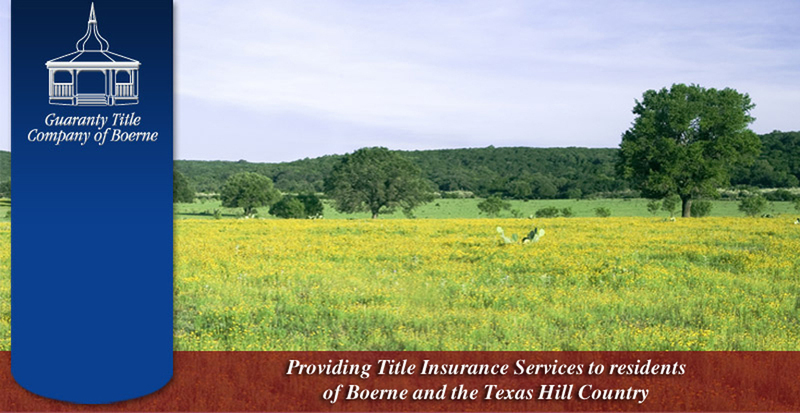 Copyright © 2005 Guaranty Title Company of Boerne. All rights reserved. Website design by Rudkin Productions.